I feel unusually close to The Snake Pit, personally, if not intimately and daily, working with one of the writers, Millen Brand, during my early days in book publishing. This, the tenth film out of twenty-one in the AMHF series, required significant research from the filmmakers in adapting an autobiographical novel by Jane Ward. Specific to AMHF, the movie was released the year Dr. Stefan de Schill accepted the position of director of research. This is a second reason I feel close to the film. The third involves star Olivia de Havilland (still living), who once served on the board of directors of another publishing house for which I was long associated. De Havilland also starred in Hollywood’s grandest epic, Gone with the Wind. Virginia Cunningham (de Havilland) is seemingly a schizophrenic inmate at a mental institution. She hears voices and does not recognize her husband Robert (Mark Stevens). Dr. “Kik” (Leo Genn) works with her, and flashbacks show how Virginia and Robert met a few years earlier. He worked for a publisher that declined her manuscript, and they bumped into each other again in the cafeteria. Despite their romance, Virginia abruptly leaves Chicago. Robert moves to New York City, where he runs into her again. After she provides a flimsy excuse for her absence and departure, they pick up where they left off, though she remains evasive. Eventually, however, Virginia brings up the possibility of marriage. They wed on May 7, but Virginia acts erratically again: cannot sleep and loses touch with reality, as she feels it is November; she snaps. The film follows Virginia’s therapy. It includes many flashbacks: her earlier failed engagement to Gordon (Leif Erickson) as well as childhood concerns. The hospital is organized on a series of levels. The better a patient gets, the higher level she is able to achieve. Virginia moves to the highest level, but there she encounters Nurse Davis (Helen Craig) who is the only cruel one in the movie. Jealous of Dr. Kik’s interest in Virginia, (purely professional), and in her eyes excessive concern, Nurse Davis is so severe with Virginia that she goads her into an outburst that requires a straitjacket. We then see Virginia demoted to what we are led to believe is the lowest level. Despite this setback, Dr Kik’s excellent care continues to improve Virginia’s mental state. When Virginia realizes that she is recovering, she attends a dance social. Virginia dances with Dr. Kik. They dance to a moving rendition of the song “Going Home” (from the second movement of Dvorak’s New World Symphony): Everyone gathers to hear this song with its poignant lyrics. Spontaneously they all begin to sing knowing that many will never leave. But Robert arrives to take Virginia home. 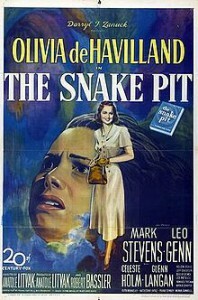 Though in measures dated, The Snake Pit contains many elements from earlier and later films that speak to viewers in the 21st century. One such is the sadistic nurse, which is central to One Flew over the Cuckoo’s Nest. Another is the use of the flashback to re-create the way the mind works out of time: for example, The Cabinet of Dr. Caligari. The biggest contribution of the film is in the depiction of the institution of the title. In real life for example, there was “the lunatic asylum” off Manhattan: Blackwell’s Island (long renamed Roosevelt Island). Again, One Flew over the Cuckoo’s Nest, equal parts satire and social commentary, is an indictment of “the system.” Bedlam, from the same general era of “psychocinematic” breakthroughs, 1946, depicts the way psychiatric patients, in the mid-18th century, were cruelly hidden away in dungeonlike institutions similar to that one. The role of therapy is handled offscreen and thus with less Sturm und Drang, in Now, Voyager, though its results are even more startling in the transformation of its central character, at war with her mother and seeking a form of salvation thro romance. Sixty-five years after its release, with all of its period-specific language and mores, The Snakepit remains one of the most realistic cinematic depictions of personal struggles within an institutional setting.